"Is it possible to resize my video that is more than 700mb for sharing on Whatsapp?" Whatsapp is now among the most popular messaging app around the world. People talk, send text, files and share photos and videos on it. But the size limit of Whatsapp is driving users crazy. Just as the users crying on Quora and other video forums, they're not able to upload a 1-minute video recorded in 720P. In an era where 4K ultra HD is becoming a standard on smartphones, GoPro, DSLR cameras etc., the mingy Whatsapp size limit seems to be ridiculous. But now, if you want to share larger videos on it, you have to compress video for Whatsapp. The maximum allowed size for documents on WhatsApp is 100MB, while the maximum size limit of WhatsApp is shrunk to 16MB only. Do you have an idea of that size? Let's see the common video sizes in our life. A 1 minute of iPhone video recorded at the lowest resolution 720P comes in 60MB or 40MB in HEVC. And the size goes up to 200MB for a 1-minute iPhone video at 4K 60fps. A typical camcorder will give you a 150MB for a 1 minute 1080P video. Therefore, in most cases, you will need to reduce video size for WhatsApp. But how to shrink large videos to WhatsApp's tiny 16MB? Is It Possbile to Reduce A 1GB Video for Whatsapp? Apparently, today's video easily exceeds WhatsApp's size limit. Many users feel hopeless, thinking it's impossible to reduce a long video with gigabytes of size to smaller than 16MB. But if you have the right tool and use the right method, it could happen. As known to all, more narrowed video generates smaller size but less quality. So which WhatsApp video compressor will hit the sweet spot? 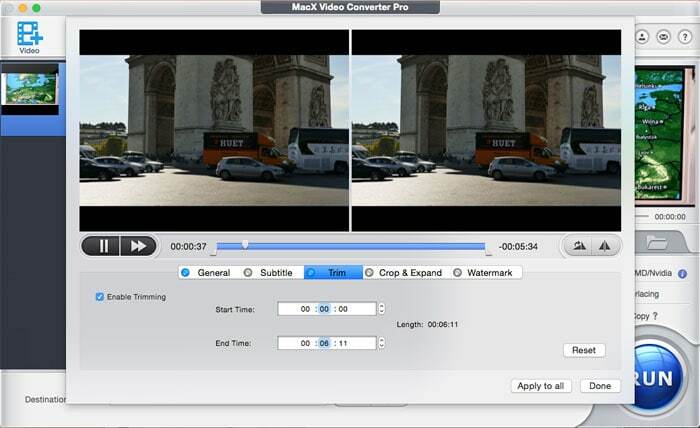 Try MacX Video Conerter Pro. 5. 3-Level Hardware Acceleration tech (Intel/Nvidia/AMD) delivers the fastest speed. 5X faster when compressing 4K/HD videos than others. How to Downsize Videos for WhatsApp by up to 70%? 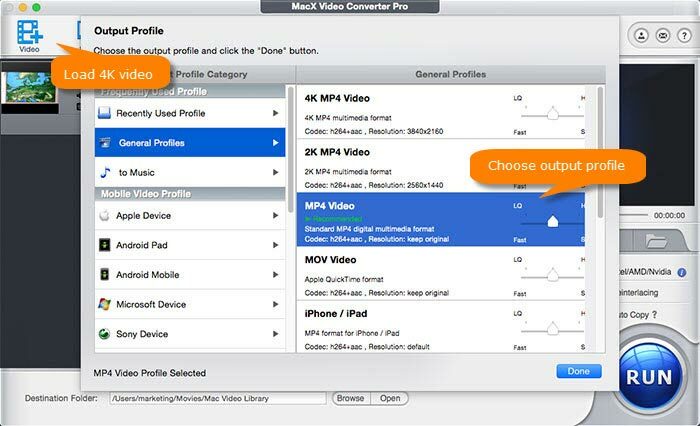 Launch MacX Video Converter Pro and click the button with a + icon to load the video. Or simply drag and drop the video you want to shrink into the software. After the videos are loaded, a window will pop up asking you to select an output format from the list. First, you should know that Whatsapp supports certain video formats only, namely MP4, AVI, MKV, MOV, FLV, 3GP (for more details, check WhatsApp video formats list). Furthermore, to downsize videos for WhatsApp, you should also know which WhatsApp format has the smallest file size. Let's check the respective size of the major formats. 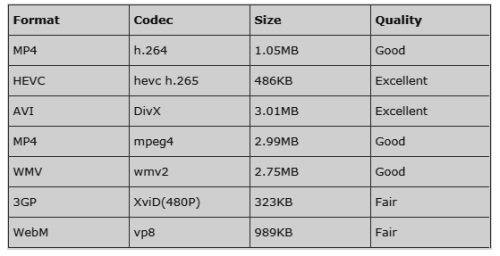 Apparently, 3GP, HEVC and WebM are the formats that have the smallest sizes. However, HEVC and WebM are not supported by WhatsApp. So if you want to send longer videos via WhatsApp, 3GP is a good choice. But if you want to reduce video file size for WhatsApp 16MB without losing quality as far as possible, MP4 H.264 will be your best bet. After selecting the proper video codec & formats for WhatsApp, click the video parameter setting button with a gear icon . It lets you adjust the raw video parameters to proper settings to further resize WhatsApp video files. 1. Bit rate - Bitrate is the amount of data required to encode a video per sceond. Therefore, there higher bitrate, the large file size. Plus, more data also means more details, and therefore better quality. Normally, you're not suggested to adjust the bitrate as it directly influences the quality. However, as Whatsapp is mainly based on various mobiles, higher bitrate may have the viewers suffer buffering issues yet lower bitrate won't generate noticeable quality difference on mobiles. Therefore, you can tweak the bitrate to make videos smaller for WhatsApp. 2. Resolution - Resolution is the number of pixels in a video frame. The more pixels the video has, the higher quality is has, and the larger size is required to hold those pixels. For example, the videos recorded at 720P 30fps and 1080P 30fps using iPhone are sized at 60MB and 130MB respectively. On a mobile screen, there is no big difference between a 1080P and 4K UHD video. Therefore, compress HD videos via lowering resolution is an efficient way. For example, by switching down 1080P resolutions to 720p, it will reduce Whatsapp video size by 50%. If you do care about the quality, lower the resolution to a level below the original is a safe measure. Higher frame rates provide smoother video playback. This is especially important for fast motions, or stutters will occur. However, this difference is more obvious on larger screen like computer or TV. Normally, you're suggested to leave the frame rate at its default. But for mobile-based WhatsApp, it's safe shrink video size by maintaining the frame rate at 23.97fps. Now click the edit button with a scissor icon to enter into the video editing page. By proper editing, the videos can be further shrinked. • Click Trim and enable the Trim box. By entering the starting and ending time, or by moving the mouse at the front and rear of the clip, you can cut out the unwanted parts from the original video. • Click Crop & Expand and enable Crop box. This is to remove the unnecessary black bars from the screen. Enter the exact number for the position, height & width you want to reserve. After all the above adjustment, simply click Run and the video compressor for WhatsApp will implement all the changes. No matter you're shrinking 8K or 4k Ultra HD videos, or HD SD footages, the tasks will be finished with fast speed. After all these measures, the original video size can be downsized by 70%. Can the video size be reduced to WhatsApp video size limit? The test figure speaks for itself. Note: Do make sure you have enable the hardware encoder box on the interface. The Intel/AMD/Nvida tech offers the fastet video compressing speed. 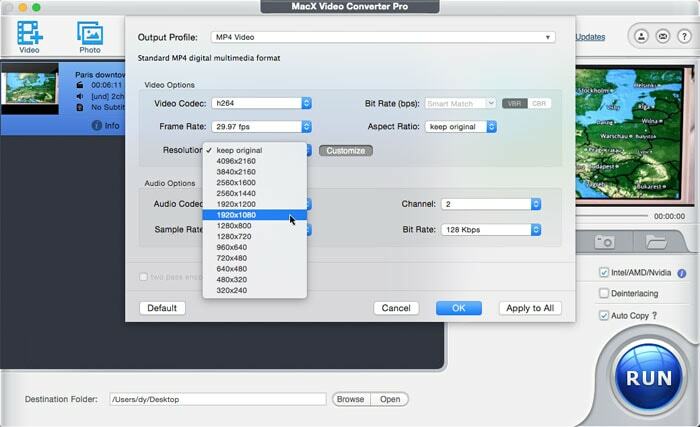 MacX Video Converter Pro is the most efficient video compressor for WhatsApp, able to reduce video from 1GB to 16MB. By converting video to smaller H.264, VP9, 3GP, lowering resolution to 1080p, downscaling frame rate to 29.96 fps or lower, cutting down videos etc, the video size can be reduced by up to 70% for sharing via WhatsApp. How to reduce the file size of MP4 to 70% smaller? Must-have video compressor for all Mac users.